TheBloomOutlet.com | If you have been hospitalized, you would know and understand the lonely feeling of people who are hospitalized. It can be lonely when just lying inside the hospital room without doing any activity and even sometimes without anyone to talk to except the doctor’s visit. It can be so boring when there is nothing to look except for the shows on television and even no good foods except the tasteless hospital food. So, when you know that your relatives or friends, especially your dear friends or anyone you care for are hospitalized, you would want to pay a visit and do something to make them feel better, right? 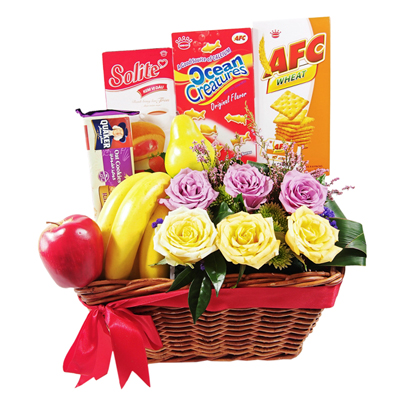 Bringing or sending a get well soon hamper is one of the best things you could do to cheer up the patient. This might be a small and a simple thing to do, but you will never know just how much the receiver will appreciate the get well soon hamper from you. This is important; you can’t randomly choose and give something without considering the age of the receiver, right? You just cannot give a get well soon basket that consists of teddy bears, candies or chocolates to elderly people since that kind of gifts are more appropriate to give to children. What’s more appropriate for elderly people is a gift basket filled with something like herbal teas, stuffed olives, or even wildflower honey. More importantly, you need to consider the physical condition of the patient. You will not want to give any gift that causes harm or worsening his or her symptoms, right? Instead, you will want to give a gift that will help the patient in the physical and even the mental healing. For example: avoid giving sweets like chocolate if the patient is a diabetic person, avoid too many sweets too if the patient has a persistent cough. Moreover, consider the personal interest of the patient if you want to make them happy. The thoughtful gift from you will eventually cheer them up since they know that you truly care for them by paying attention to the little details. For example, you can give them a personalized get well soon hamper with some books packed inside if you know that the patient loves to read. Puzzle books, coloring books, or fairy tale books might be perfect for children while magazines, self-help books, or novel might be perfect for teens and adults. When you know what is the most appropriate gift to give, you surely will be putting smiles on the recipient’s face and make them feel better soon.